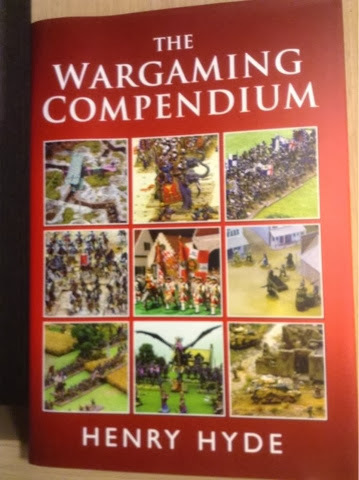 For quite some time I've been meaning to post an embarrassingly effusive review of Henry Hydes's book, The Wargaming Compendium, which I got my grubby paws on earlier in the summer soon after it came out. Now, this sort of generic "guide to wargaming" isn't normally the sort of thing that floats my boat - I'm no hard-core grognard, but I think that I know my way around a table, have painted just a few toy soldiers in my time, and have hardly enough days in the week to read the military history and hard SF which populate the rest of my to-do book and Kindle pile. So, why on earth would anyone want to add to that something which is basically a wargaming primer on steroids? Well, for starters, the steroids have certainly helped this little idea of a book grow up into a strapping hulk of a coffee-table-gracing tome. Weighing in at the "wow, that's as much as a decent sized tool box" level, the whole thing exudes quality from the cover inwards. And it's the innards that really cut the mustard, with over 500 pages seemingly almost all of them carrying at least one colour photo or illustration to grace the text. The book itself is divided, FoG-style, into sections which are colour coded by a small block on the edge of each page - starting off with a colourful introduction of how the author got into wargaming in the first place (a Britains cannon that fired match sticks if you must know) through "Basic Concepts" (stuff you can use to explain to a non-initiate what is going on) and then leading right into one of the best sections of the book - a History of Wargaming which could almost stand up as a (40-page) book in it's own right, containing a nice mix of geeky historical details from the 1800's plus some bang up to date moments of "oh, yes, I had some of those!" as well. Other sections include "Choosing a Period" (which could easily be re-titled "all you needed to know about the periods you don't currently play but have occasionally thought about, in a nutshell"), "Assembling your Forces" (a well illustrated section on basic painting techniques, with an especially useful reference section on painting horses), and then a few chapters which go into detail of periods as diverse as the Wild West, Gladiatorial Combat, a map-based game in Ancient Greece and even a fairly full-on set of rules for 1685-1845 European combat, all well presented and written to clearly illustrate how the author has built up the rules from basic concepts to the finished game. The rules bits I did admittedly skip through a little - one day I might revisit them, but the periods are not that interesting to me and to be honest I almost felt like I had squeezed full value out of the book by page 255 (where they start) anyway! The book then moves on with a canter through "Other Aspects of Wargaming" which have not already been covered, including naval, air combat, roleplaying and pulp actions, all again with excellent photos on every page before wrapping up with a "Digital" section which covers basic figure photography, and how to use and set up a basic wargames blog or website (what a good idea...!). Right at the back there are 30 pages (yes!) of reference lists, covering manufacturers, a UK show calendar and a list of UK museums amongst other things. Where the book impresses most is to manage, somehow, to weave the "beginner" aspects into something which even a well seasoned old git like myself found genuinely enjoyable and interesting to read - often much to my surprise. If you wanted to nit-pick, you could say the home-brew rules are a bit, well, home-brewed and cover periods that may not be of interest to everyone... but even skipping this whole section still leaves a 300+ page book! Some readers might also get a little tired of the writing style, which on occasion veers a little too far towards "so, dear reader, as you send forth your brave miniature troopers once more on their quest for glory for your burgeoning tabletop empire...." but to be honest even this a pretty forgiveable transgression, either on the basis that it is pretty clearly a consequence of the authors enthusiasm for the subject, or even that it sometimes lends an air of "HG Wells" to the whole proceedings anyway! Bottom line is that you probably should add this to the list of "must have" Wargaming books, whatever your interest are - and this is a pretty short list which essentially comprises Harry Pearson's "Achtung Schweinhund!" (which now appears also to be available on Kindle), a Donald Featherstone or two and perhaps not much else. And in any case, it's Christmas soon, so you could always send one of the links below to your better half as a suggestion for your stocking! Good review. I've had this on my Amazon wishlist for awhile. Hopefully Santa will deem me a good boy this year.